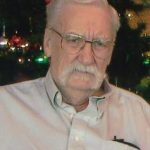 Larry Vernon Williams, 74, of Granbury, passed away on Friday, October 19, 2018. No services are planned at this time. Memorials may be made to the American Heart Association. Larry was born on April 13, 1944 to Roscoe and Vessie Williams in Ada, Oklahoma. He married Ima Jewel “Jody” Ganey on September 12, 1979 in Galveston, Texas. He was a good husband and father who cherished his family. He enjoyed painting, wood working and writing cowboy poetry. He was preceded in death by his parents, two brothers, and his wife: Ima Jewel “Jody” Williams. Larry is survived by his daughter: Kim Oakley and her husband Kendall. Be the first to share a memory of Larry .